Programmable Logic Controllers (PLCs) are the major components in industrial automation and control systems. The controlling nature of PLC is ranging from simple- push button switching to a single motor to several complex control structures. 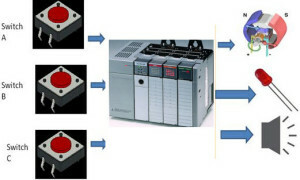 The PLC programming is an important task of designing and implementing control application depending on customers need. 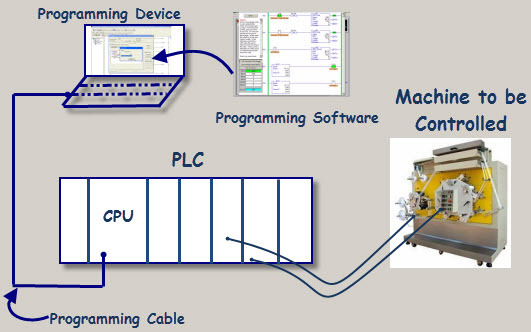 A PLC program consists of a set of instructions either in textual or graphical form, which represents the logic to be implemented for specific industrial realtime applications. A dedicated PLC programming software comes from a PLC hardware of specific manufacturer that allows entry and development of user application code, which can be finally download to the PLC hardware. This software also ensures Human Machine Interface (HMI) as a graphical representation of variables. Once this program gets downloaded to the PLC and if the PLC is placed in Run mode, then the PLC continuously works according to the program. Before going to the program of the PLC, let us know the basics of the PLC programming tutorial and its basic concepts. Compared with text based languages, graphical languages are preferred by many users to program a PLC due to their simple and convenient programming features. All the necessary functions and functional blocks are available in the standard library of each PLC software. These function blocks include timers, counters, strings, comparators, numeric, arithmetic, bit-shift, calling functions, and so on. 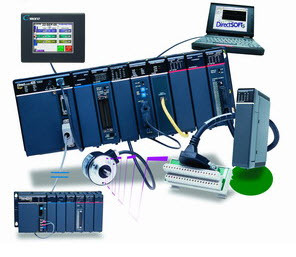 Various types of programming devices are used to enter, modify and troubleshoot a PLC program. These programming terminal devices include handheld and PC based devices. In the handheld programming device method, a proprietary device is connected to PLC through a connecting cable. This device consists of a set of keys that allows to enter, edit and dump the code into the PLC. These handheld devices consist of small display to make the instruction that has been programmed visible. These are compact and easy to use devices, but these handheld devices have limited capabilities. 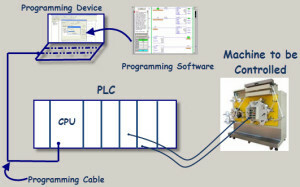 Most popularly a Personal Computer (PC) is used for programming the PLC in conjunction with the software given by the manufacturer. By using this PC we can run the program in either online or offline mode, and can also edit, monitor, diagnose and troubleshoot the program of the PLC. 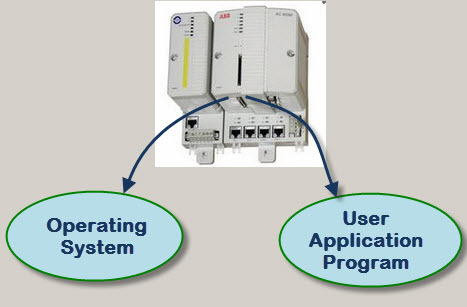 The way of transferring the program to the PLC is shown in the above figure wherein the PC consists of program code corresponding to control application which is transferred to the PLC CPU via programming cable. 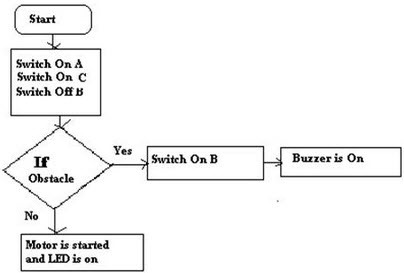 Among several programming languages ladder logic diagram is the most basic and simplest form of programming the PLC. Before going to program the PLC with this language, one should know some basic information about it. 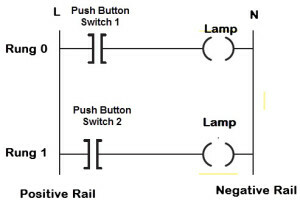 The below figure shows the hardwired-ladder diagram wherein the same lamp load is controlled by two push button switches, In case if any one of the switches gets closed, the lamp glows. Here two horizontal lines are called rungs which are connected between two vertical lines called rails. 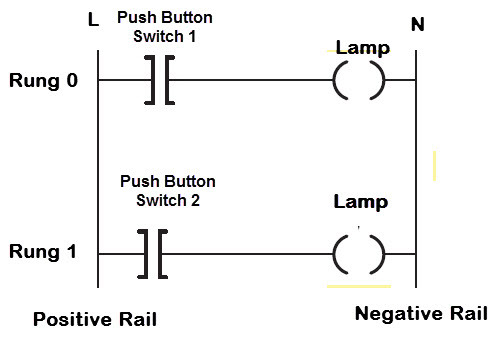 Each rung establishes the electrical continuity between positive (L) and negative rails (N) so that the current flows from the input to output devices. Some of the symbols used in ladder logic programming are shown in the figure. Input switches are types include normally closed and normally opened as shown above. In addition to above given functional symbols, there are several functions like timer, counter, PID, etc., which are stored in the standard library to program complex tasks. The procedure for programming a PLC for a certain application depends on the type of standard manufacturer software tool and the type of control application. But in order to give a basic guidance to the students, this atrticle provides a simple approach of designing control application in PLC programming software, as given below But this way of programming doesn’t exactly fit into all the types of programming tools and control applications. The primary step to program the PLC is to get the idea for which you are going to develop an application-based program. If you are driving a line follower robot by the use of DC motor when the push button is pressed. This status must be displayed by the LED light when the motor gets turn on. The motor is also attached with a sensor (Here it is considered as another switch) that detects obstacles, so when this turned on, the motor should be turned off. And correspondingly, if the motor switched off, the buzzer should be turned on. 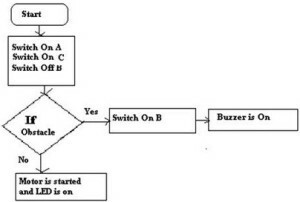 The variables of the above project are M: Motor, A: Input Switch 1, B: Input Switch 2, L:LED and Bu: Buzzer, and the designing of the logic is easy with the implementation of flow chart, which is given below for the above application. Open the programming software installed in the PC that comes with PLC hardware. Select the hardware model of the PLC in the software and configure it with appropriate input and output modules. Select the ladder language (LD) from the list of the programming languages, and choose the hardware processor and give a name for the program. Add the required rungs based on the control application logic and give the address to the each and every input and outputs. 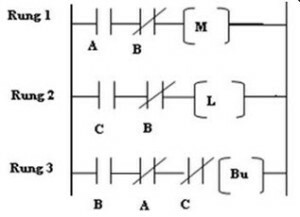 The ladder logic diagram of the above discussed example is given below. Locate the Online section in the menu bar and select Online. Check for the errors and make necessary changes after selecting Offline. Again, go online and select the Run option to simulate it. After the successful simulation of the program, download the program to CPU by selecting the Download option through a network or communication cable. This is about the PLC programming basics and its procedural steps. We hope that the given content is clear and easy for understanding. It is also possible to know and understand it better with specified software of particular PLC like RSLogix 500, Codesys, step 7, etc. You can share your views, suggestions on PLC programming or if you want any help pertaining to the examples , then write to us in the comment section below. I want to learn PLC programming of BnR make, Siemens make PLC’s and to programming a vfd. How should I approach and whom to contact for the said purpose. Sorry, we don’t provide any training.